To the uninitiated, the Magic Hedge might sound like a happy place in Mister Roger's Neighborhood. But in fact it is the Montrose Point Bird Sanctuary, a popular stop for migrating birds on the shores of Lake Michigan, on Chicago's North Side. 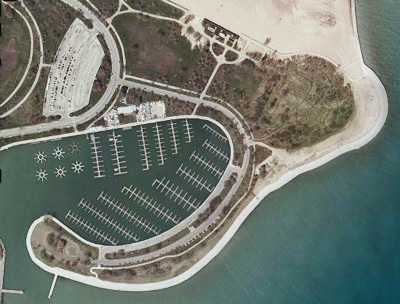 This shrubby spit of dunes is tucked in between the Montrose Harbor marina and the ball fields and beaches of Montrose Park. The Magic Hedge attracts many charismatic birds, as well as many avid birdwatchers who obsess about the quality of the transient avian fauna. As birders go, I'd call myself an "advanced beginner." I know most of the easy species, but the impulse purchase of a guide book for warblers set me on a new path of birdwatching a couple years ago. One weekend in early May offered up wonderful cool and sunny spring weather, so I packed up my bird book and binoculars and made my way back to the Magic Hedge, where I'd been dazzled by the spring migration the year before. I hoped my timing was right to see glimpses of interesting visitors. I could also bet there'd be dozens of other bird-seeking souls, optically enhanced with scopes, cameras and binocs. Part of the game for this rookie birder is to see what the "pros" are staring at any given moment. Watch the watchers. My technique is to quietly sidle up to a knot of people who are staring deeply at some tree or shrub, try to see what they see, and catch the bird's name. In my experience these people are all too happy to share what they know with those of us near the bottom of the learning curve. My informal survey says that your typical pro birder is in the 30 to 60 age range and outdoorsy, earnest looking and often bespectacled. If I had to guess, they might drive a Volvo. And sometimes it's easier to tell the pros from the rookies just by the equipment they sport. While many birders seem to walk around with their finger stuck in a bird guide, the representative pro might also have a little field vest, cap, binocs, or maybe even one of those high-end spotting scopes. In fact, one's choices in optics seem to be a determining factor. Almost anybody can have a cap, but only a rare few look like they're set up to trek the Serengeti. Yet they share the same thin paths, stalking avian prey in overgrown honeysuckle bushes just like the rookies. On this particular visit the pros were in short supply. The big migration apparently hadn't yet kicked in yet. I knew this because two or three of the middle-aged vested folk would appear, look around, shake their heads knowingly to one another, then hightail it out of there — all inside of 10 minutes. Apart from me there were only about a dozen other birders who lingered; some were clearly pros — one man was toting around a giant telephoto lens on a tripod — but most were amateurs. Perhaps we were driven by hope, foolishness, or the just a chance to enjoy a sunny day on the lakefront. As I wandered, squinting hopefully for passing avian visitors, there were robins hopping around everywhere. Now that's a bird that even I knew. At first I ignored them, thinking them too common for my attention. After all, I was looking for celebrities like Chestnut-sided warblers, scarlet tanagers, and indigo buntings. But maybe this was a great chance to enjoy the birds that were there, whatever their star quality. Besides, this would also give me a chance to get more familiar with my binoculars, a new little pair of Nikons that I'd rarely used. I'll often miss out on birds I really want to see. They fly off before I can even get a look at them because I'm fumbling with the lens caps or trying to focus. So I stood north of the Magic Hedge, on the mowed lawns of Montrose Park, watching a half-dozen robins patrol the turf for their breakfast of insects and worms. I spent a minute or so focused on one who was snoozing, on one leg, duck-like, on top of a little metal park sign. A crow passed quickly through the scene, lighting briefly in a bright green linden before flying into the open park. These days a crow is a welcome sight after so many have died from the West Nile virus. I rounded a row of honeysuckles and saw a couple of grackles working through un-mowed grass, I quietly watched them through my binoculars. Grackles are typically inky purple in color but the light must have been just right, as they shone with subtle colors that were simply tropical. One that I watched the longest strutted patiently through the ankle high grass, with feathers that had an iridescent olive green cast. His eyes were bright and yellow. I think these two were mated as they indulged in a little courtship display. At one point, they met, both looked skyward — cranelike — and then went about their foraging. There were a handful of red wing blackbirds scattered about, noisily proclaiming their territories. Years ago I worked in Lilacia Park in Lombard, Illinois where a handful of blackbirds would nest each spring. That was the first time I'd ever seen them up close. They are territorial and noisy and I have been fond of them ever since. I next scanned the shrubbery, looking for some of the more skittish warblers. But 30 feet up in a maple a male redwing was raising so much commotion that he seemed to be begging for attention. Really. Here I am looking for reclusive stars in the brush while overhead is this bird with spectacular scarlet and yellow shoulder patches aflame in the morning sun. I wonder if it's this quality of the morning light that is causing me to see things anew. I paused and indulged the redwing as he carried on, trilling, and even at one point raising his wings slightly and nearly sighing in resignation on his tree top. I wonder what the female redwings think of this racket? They must be nearby, but probably well hidden. Perhaps there can only be one ham in the household, so I imagine they just let their old man carry on. After another hour the sun got up higher, and the birds went to wherever they go when morning turns to midday. Most of the humans had left the sandy trails too. I did manage to see one new bird that day. A couple of helpful pros pointed out a swamp sparrow to me on an interior trail. But at my current level I doubt that I could pick out another one. 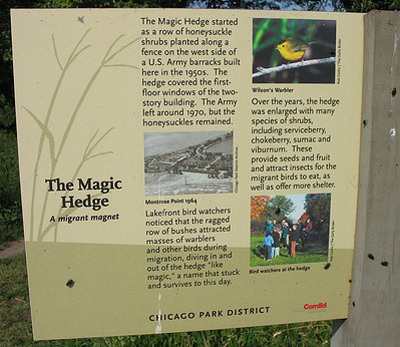 I might have driven away from Magic Hedge feeling disappointed, because I didn't see the rare and exotic migratory birds that I'd hoped to. But I felt satisfied in an unexpected way because I saw new colors and behaviors in the familiar birds I see all the time. I'd been guilty of dismissing the beauty of these creatures simply because there are a lot — some say too many — of them. But being many in number is not a sin. I think that many birders enjoy seeing new species, adding numbers to their own personal lists of birds they've spotted. I think I have fairly strong "listmaker gene" inside me as well. But I also think there is a deeper satisfaction in getting to know an individual species, or group, really well. Aren't these robins, grackles and blackbirds our true companions? They too have adapted to survive in tough and challenging circumstances. And like yellow in dandelion we must be grateful they color our world with all that they can offer. Dave Coulter is a horticulturist trying to keep his habitat from shrinking in Oak Park.